Fifteen years already? That went by fast. When Richard M. Daley dug up Meigs Field in the dead of night, on March 31, 2003, it seemed an unhinged, illegal act, the worst thing the mayor had done during his administration—we didn't realize then just how badly he was mismanaging the city's finances, digging a hole that Chicago struggles to crawl out from to this day. 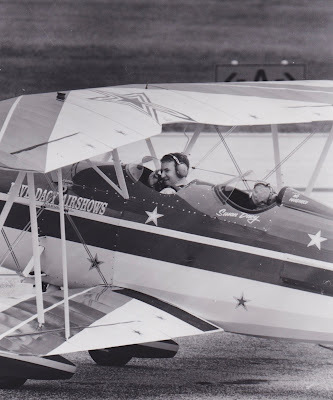 I loved Meigs Field, and was lucky enough to take off the tiny lakefront airstrip once, in Susan Dacy's stunt biplane, to do barrel rolls and loop-de-loops over Lake Michigan. This column ran in 2012. What impresses me most is that, six years ago, I'd actually phone the mayor's office to try to get his reaction on something. Now that's inconceivable, because I can't imagine him giving a candid response on any subject whatsoever, nor anybody caring if he did. Rahm Emanuel is a controlled, close-to-the-vest kind of guy. Despite his reputation when elected, there are no spontaneous explosions from him, alas. No colorful sputterings of public outrage for us in the media to have fun with. Especially when it comes to the various chronic urban problems created by his predecessor, the unlamented former mayor, Richard M. Daley. Emanuel has gotten quite good at addressing some inherited problem while pretending it just popped spontaneously into being, as if an act of nature, and wasn't dumped into his lap by the carelessness and folly of his old pal. So it was odd to see Emanuel this week seem to defend Daley's biggest lapse while mayor: the surprise, probably illegal 2003 destruction of Meigs Field, the city's downtown airport that . . . well, why re-invent the wheel? "Meigs Field was an urban jewel and a unique lakefront asset that will never be replaced," the Chicago Sun-Times wrote in 2005. "As tragic as its loss was to the vibrancy of downtown Chicago, worse was the dead-of-night manner in which Mayor Daley destroyed it two years ago, without question the most extreme abuse of power he has committed in a decade and a half in office - well, as least the most extreme we know about." "Even if it were a good move—and it wasn't—he did it the wrong way. I might want an omelet for breakfast, but that doesn't mean I want Mayor Daley to break into my house and prepare it while I sleep." Granted, I'm an airplane fan. What man with a pulse isn't? I've always rejected the argument that you had to be a bigwig using Meigs to jet from deal to deal in order to benefit from the field. Many, particularly kids, liked to see the aircraft come and go. The terminal was a small gem of late 1950s modernism. The place had a lot of history. Going for a ride with Bill Lear, who was showing off his new Learjet, a Daily News reporter looked out his window and said that scant Meigs runway looked "like a stick of gum." The city has mile after mile of underutilized lakefront park, and it made no sense to destroy Meigs just to add a few hundred yards more. So ruining Meigs was a mistake, and Daley doing it in his I'm-the-King-of-Chicago-I-can-do-what-I-please manner made it worse. Time is a balm, however. Asked if digging up Meigs was the right thing to do, Emanuel initially said, "It is right, yes, on this level, this way: Meigs Field is no longer there." But that seemed to be saying that the ends justify the means. Whatever works, just do it. "I'll leave it to others to make that judgment," Emanuel continued. "I think it was the right thing to do." Which is it? Since I wasn't there, I thought clarification was in order. Perhaps the mayor was flustered by my colleague, Fran Spielman—a no-nonsense, tough-as-nails, Front Page, honed-razor of a newspaper reporter who will cut out your heart and make you comment on it as you die. If she asked me the time, I'd start to cry. I thought, to be fair, I had better check with Emanuel's office. So he approves of Daley's most power-mad act? "No way, no how," his office replied. Well, that's a relief. So does that mean—follow-up question!—that the mayor is not laying the groundwork for his own extra-legal, unilateral acts? That he won't, oh, decide to fill in Belmont Harbor? Because really, who enjoys that? A handful of rich boaters. That's all. Why indulge them when the city could seize the lagoon and fill it in. More campground for poor kids! And the Water Tower—it really jams up the intersection. Why not pull it down in the dead of night and reassemble it south of Roosevelt Road, where congestion is not such an issue? And why go through all the bothersome hearings and preservationist thumb-sucking and hobbyhorsing that are the hallmarks of a free country, or were, when a powerful mayor can simply decide it's the best thing to do and then command his quivering underlings to see that it is done while nobody's watching? Again "No." Emanuel is celebrating his ill-gotten gains, but not the act that got them. I suppose he can't, at this point, put the airport back. Too late for that. And, looking forward, as he wants us to, transforming Northerly Island to prairie might turn out wonderful. The idea of camping there, with the stunning cityscape arrayed before you, is enticing. I'd sure give it a try, for a night. But I think it's too early for anyone to shrug off what happened to Meigs. It was a crime. 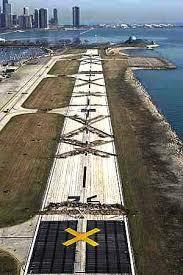 Daley ripped up the runway while planes were still parked next to it. It cost the city more than a million dollars in fines, and sent a chill down the back of Chicagoans, or should have. The city kept re-electing the guy, and now it's got another mayor for life, whose office insists he is definitely not, no way, no how, testing the waters to see what the public will accept. Let's hope not. I still can't figure out why or rather for what purpose Daley destroyed Meigs. His stated reasons don't make any sense of course and as Neil says, even if it were a good idea, to just up and dig up the runway in the middle of the night was ludicrous, almost insane. It calls for a dissertation. I've always rejected the argument that you had to be a bigwig using Meigs to jet from deal to deal in order to benefit from the field. You shouldn't, because that was exactly the case. Why should a stretch of prime lakefront property, owned by the city, be set aside for a bunch of rich assholes? If standing in line at O'Hare with the hoi polloi is too much for them, they can always use Palwaukee or another such place and spend 45 minutes in their limos to get to wherever their important asses need to be. Many, particularly kids, liked to see the aircraft come and go. Lots more aircraft come and go at O'Hare. Yes, it was autocratic and dictatorial for Daley to do what he did. And it made my heart glad. If he had tried to hold hearings or whatever, the rich assholes who used Meigs for their Lear jets would have tied the city up in court for who knows how long, forcing it to spend tax money that would have been better spent on just about anything else. There's not much to add to Neil's spot-on take regarding this matter, but I certainly whole-heartedly agree with him. I'm no bigger fan of "rich assholes" than you are, but Meigs Field was a worthwhile piece of established infrastructure for the city. Tearing it up was stupid, among many other things. The fact that I didn't personally benefit from it, due to my inadvertent mistake of not owning a Lear jet, doesn't change that fact. I've been to that area, both when it was Meigs, when it was no-man's land afterwards and during the various phases of it being developed into the park it is now, dozens of times. I've liked the area all along. I'm not unhappy that there's a nice park there now, but, as NS notes, there's lots of lakefront to explore without it. Well, Jakash, with all respect, would that "there's lots of lakefront" argument have cut any ice with you when it came to that horrendously stupid Lucas museum? Lake Michigan may be plenty big, but its shoreline is not infinite. Converting part of it from a convenience for people with private jets to a public park was the right call IMO. As for "King Richard," I flatter myself that I have the ability to recognize a good decision, no matter how otherwise loathsome the person who makes it may be. Who knows, maybe that will even happen with Trump one day. Sure, Rahm was testing the waters. What elected official doesn't? He was testing the waters when he wanted to allow George Lucas to land his spaceship on a lakefront parking lot. Cleveland movers and shakers keep bitching about what a waste of precious land our (much-bigger) Burke Lakefront Airport is, and that it's only used by rock stars performing downtown or, occasionally, a pro sports team that is visiting the downtown ballpark or the arena next door. They want to close it down and replace those unnecessary runways with high-end housing and retail...in a city with thousands of abandoned homes and millions of square feet of shuttered retail space. Cheer up...at least Chicago got more park land from that high-handed midnight land-grab, and not some pricey lakefront enclave. And Daley the Younger was merely stealing a page from mid-20th century history. The Germans also invaded their victims in the wee, small hours of the morning.